The ACR122 Starter Kit enables low cost and easy development of software applications using contactless cards and NFC tags and devices. 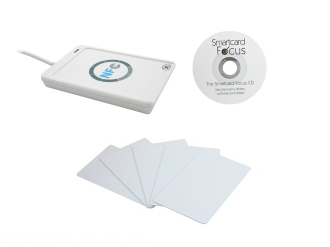 The package includes the popular ACR122U reader, several NXP MIFARE 1K cards and the complete set of software tools, developer documentation and code samples from ACS on CD. The ACR122 USB is a modern, light weight contactless reader/writer which supports both MIFARE and ISO 14443 A/B cards as well as FeliCa and NFC tags. The ACR122's compact size and trendy design allows for easy integration in many different application areas.